Follow @mcphoo Tweet Part 1: P90x Overview and "muscle confusion"
Does P90X "work"? That really depends on what a person means by "work." And that's why this series is going to take a look at what "work" might mean, how well P90X might "work" and whether there are alternatives. We'll look at what's on the label vs what's in the tin. This is a several-part follow up review of P90x two plus years after completing it and learning a whole lot more than i knew then about our bodies, nutrition, health and fitness. Does p90X work - by its own terms - and if so for whom under what conditions? part 1: (this post) considers muscle confusion and the various X workouts - should they be X'd? do their names really mean what's under the label? If you're considering P90x as a workout program, super. If you do the program, you will feel different by the end of it. You may be a wee bit leaner, or a lot leaner depending on how much you're eating before you start with this program. So there'll be a tremendous feeling of accomplishment to accompany the exhaustion if you are one of the folks who starts it and finishes it. If you're already doing P90X and feeling great you may wonder how anyone could critique it and its wonderful variety. I know what you mean. That's why i'm doing this over several articles. But first an overview of where these are going. No doubt feeling great is feeling great - especially if you feel stronger, fitter and are starting to drop weight and that's what you want. Fabulous. What we're going to unpack in this series is that P90X, despite all the variety of its workouts, is actually a cardio circuit program. That means it's privileging one energy system and one type of strength. Despite all the seeming variety with resistance and kenpo-x and plyo-x and abRipper-x etc etc, it's working on one energy system of 4 (oxidative) and one type of strength of four (endurance). By the final part of this series we'll see why focusing just on this approach alone is, relative to our rich complexity, quite partial. So that's part of the critique too: P90X is dressed up to look like it's far more holistic than it is with all its many routines. Again, let me say that if you want to do nothing but endurance cardio, that's fine. But even endurance athletes work their different energy systems and strength types. We'll also see in this series, there are many other ways to achieve the ripped abs of P90X that don't take as much time, and also work other energy systems, and fundamentally, are about diet. We'll also take a peek at the oft neglected nervous system, and something called the SAID principle, and see what happens if we look at bringing that into our practice deliberately. In other words, by the end of P90X, yes folks will feel better - even feel like they're really working out, grr, while doing P90X's 7 hours a week - but not for the reasons P90X claims. You may be doing work you think is doing certain things that it isn't, and for reasons that are well, spurious. For instance, as we'll see in this post (1) P90X's main tenant of muscle confusion as the way to keep progress happening turns out to be baseless; (2) none of its workouts will deliver more fat loss than one could get with diet alone, without better attention to diet than p90x gives it (with a sort of exception of one case considered in part 2, called EA level 3); (3) very few people who say they start the program ever come back to say they finish it; this may be why there's been little structured "after p90x" advice available until more recently. Yes, there's P90X Plus or Insanity, but suffice it to say P90X+ is 5 more variants of P90X workouts -to mix in with P90X, and Insanity is even more cardio - and in part 3b we'll look at why more of the P90X same mayn't be in your best interests. In this series, in the first two parts we'll like to look at (part 1, this article) the claims of p90x like muscle confusion, (part 2) we'll look at whether the package can deliver on "getting ripped in 90 days" and for whom, from it's nutrition/diet approach to its workouts. In the last part, we'll look alternatives to P90X's nutrition (part 3a) and workouts (part 3b) that will last beyond 90 days. The goal of this series is that if you decide you still want to "bring it," you can do so with a clearer sense of what's really in the program, how it works, what will help it work better, how to get closer to the results you want, and what alternatives you might want to pursue and why. You may also decide there are other ways to get better results in less time. (that's part 3, to follow). In part one of this review, we kick off with a brief overview of P90X and then consider "muscle confusion" and the special case of "Yoga-X." In the second part we'll look at the role of diet in the hunt for 6pack abs, and in the final part we'll look at completion bail outs, what happens when the track runs out at the end of P90X and alternatives. P90X contains 12 follow along DVD's of various workouts for cardio and largely bodyweight or resistance work. The package also contains program guides for what vids to use when. And it has a small pamphlet on diet along with recipe suggestions. The review i wrote about completing p90x was until recently a top ten results for "review p90x." What happened? P90X's marketing has changed so that people who sell P90X effectively have to put up clone p90x web sites that feature "review" as their title, but aren't really. They've paid beachbody.com 40 dollars for the privilege of getting a commission from sales of P90X that go through their sites. Nothing wrong with affiliate sales, but the effect of this approach has mean that folks who just review p90x have their *real* reviews buried into about page 4 of google results. A couple of months ago the top P90x review was from a blog called "shaping my way." Where is it now?? The concept of P90x is appealing - it certainly was to me: for people who once knew what being in shape was, but they now have fallen out of shape and are keen for a "real" workout they can just DO that doesn't require going to the gym to get back in shape. That's what P90X says is on the tin. Sounds really sensible. P90X is sold largely by infomercial. And so here comes Tony Horton who developed the program. Fit guy of 47 at the time - right in the target audience zone - way better shape than most guys ten years younger. And he's saying, right, back to basics. Three days a week resistance training and plyo; three days a week various cardio/stretching/yoga type stuff. You see shots from the really basic type workouts: pull ups, push ups, jumping, lunges, curls, kicking, punching, intense yoga. Real people sweating real sweat. Looks real; looks good, looks like work. You see all sorts of real people following along at home while watching the DVD's. More reality. Before we begin, let's tease apart a couple of the claims around P90X - do this program with intensity, and you will get stronger, build muscle and of course, based on the before and after pictures, get ripped. Note: there is nothing wrong with following these workouts. And if having such a totally programmed plan works to get a person back onto the road to well being then fabulous. I'd just like to take a closer look at what's on the label of this tin. First up: muscle confusion. Muscle Confusion is Confusing the Facts. The rationale for this change up after three weeks of effort is to surprise the muscles - hit them from a different angle - so that they don't get used to the effort and stop growing, plateauing. This concept sounded so sensible to me at the time. It turns out, though, it's kinda crap -not total crap in terms of the concept - but total crap at this level of application. Let me explain. P90X is a 12 week program. It is specifically aimed at (marketed at) de-conditioned people. In that respect, this population is pretty much like folks who haven't trained before. Pretty much. As such what the research shows repeatedly - and this has been studied a lot - is that a deconditioned/untrained person can do ANY program for 8-16 weeks, and they will get stronger. If they're really untrained, as opposed to not having been working out for awhile hypertrophy - that body builder effect - isn't particularly likely to happen either. Indeed, this research informing these ideas on training adaptation is so standard now it's become part of any core text-book on the physiology of strength and conditioning. IT's a core part of training in programs like the NSCA's CSCS certification, and in physiology courses. Here's just two texts with references in google books to these concepts to see for yourself: 2002 Hoffman Physiologic Aspects of Sport Training and Performance and 2006 Donatelli, Sport Specific Rehabilitation. The research goes back to 1988, so this isn't earth shakingly new stuff. How does muscle building work: adaptation to load. A summary of part of the above work is that, for the first 8 weeks of any resistance program, the main adaptation is neurological: that is, the nervous system is getting used to bringing muscle fibers into play and figuring out what fibers to use. Very little if any of this period is actual hypertrophy, that is the growth of new muscle fibers. 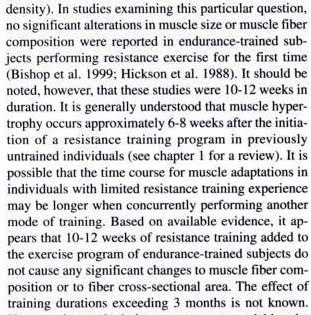 After the first 8 weeks, what triggers growth is still adaptation to load, but between now and 12 weeks, muscular adaptation may also begin. So main point: the effort needs to keep challenging a person or adaptation ceases. That lack of challenge is the ONLY reason why adaptation ceases (until hitting optimum genetic potential- and that sure doesn't occur in a few weeks). And this is the only reason why people hit plateaus in their program: using the same number of reps at the same weight with the same number of sets gets to a point of no longer being a challenge. The body has simply adapted to that movement with that load for that period of effort. Only one of those variables needs to change to force adaptation. Note: the exercise itself does not have to change. Alternative One: A great method to induce challenge/adaptation is used by Pavel Tsatsouline in Power to the People (two moves: a deadlift and a side press). The approach is to wave the load, over a week: up bit each day for a few days, then back a bit, then starting up the next wave with a bit more. Each week, each day's last load gets a little heavier so weight load is progressive even as it falls back. The moves don't change; volume is varied. Remarkable progress; no burn out. No confusion. So, looking at P90X, in three weeks of a new program for a de-conditioned person, since muscle adaptation hasn't really even started to take place, why change the program? One answer is to reduce boredom. The biggest problem a program like this faces is quitting and wanting one's money back before the 90 days are up. Here's there's a promise of change throughout the whole period. So how do you know what those four week sets are going to be like until you've tried them? Variety is the spice of continuation for a lot of us. Even so, folks who comment about the dvds on the forum find that watching the same ones over and over get a little tedious. How much confusion, really, in P90X? If you look at the actual workouts that change, there's not *that much* that's different about them. The main thing is the arms routine of the first few weeks is broken into biceps and triceps days rather than just "arms" day on shoulders day. In other words, two workouts a week now have three specific body parts in the same length of time as did for two previously. They're just slightly different exercises that lets a person pop in a new dvd and feel like they're getting a new workout while also getting that special adaptation buster, muscle confusion. The point of this critique is to show that muscle confusion is not really what's going on here: the muscles are not being "tricked" by new challenges to keep adapting to a routine that would otherwise cease to induce change. As we can see from standard work, the exercises themselves haven't been in play long enough to induce complete neural adaptation, never mind any kind of muscular adaptation. At best, changing specific arm exercises is certainly one way to reduce boredom of a routine; changing the outfits and participants on the DVD set is another. Both are used here. This is not to say any of this is a *bad* thing. Boredom can be real, and if it stops a person from working out, then there's a problem. Yes is there such a concept as muscle confusion? Google searches return numerous non-expert sites that cite the term (often pointing back to P90X). As best i can tell, Tony Horton did not invent the idea; it comes from the body building world where trainees want to squeeze every millimeter of hypertrophic growth from their muscles. By changing up exercises to hit an already well-developed muscle from a variety of angles, the idea is that this will help to bring out every possible fiber to optimal effect. This exercise variety for muscular development is not quite the same as a belief that one has to change exercises to fight plateau/adaptation. Some attribute the body building concept of muscle confusion to Vince Gironda; intriguingly it's not a concept you'll find in the research literature for muscle physiology. Try checking "muscle confusion" in pubmed, or in the Jounral of Strength and Conditioning Research. Nada. So what is "muscle confusion" in P90X? Really. As said, there's nothing wrong with changing up exercises a bit every few weeks if it keeps you going at them, and really all beachbody wants to do is keep you invested in the program for 12 weeks to avoid giving you a refund. And because if you do anything for 12 weeks in a workout sense you will see these kinds of improvements, it really doesn't matter what they ask you to do; it just has to be something you WANT to keep doing. We'll come back to this lack of post P90X support in part three. Are these the best exercises anyway? for that 12 week period? Yes and no. Pull ups and push ups, a core part of the P90X program are solid. They're refereed to as compound movements because they involve more than one muscle or muscle group. The bodyweight legs program, also pretty good for being likewise mainly compound - though wall squats can seriously be thrown out: these are simply isometric holds and have very little transferability - in other words doing a lot of wall squats will not help build capacity to lift the coach up the stairs. In p90x, wall squats get better over time because of the other leg work; not the other way around. See, again from the literature, for someone who has not been training, the best resistance start is with compound work, not isolation exercises. That means no biceps/triceps stuff; lots of pushes and pulls that involve the whole body. Even if big arms are a goal, especially when starting a program, compound work is the best way to go. So maybe those arm curls are in there for packaging rather than real benefit? Another exercise to chuck: plyometrics. The pylo workout is referred to as the "mother" of all P90X workouts. And that's what it is: a survival routine. Can you get through over an hour of jumping on one leg? Real plyometrics are stressful to the body. An hour of them is close to insane for neophytes, and they were never designed as cardio. They were designed by eastern sports science as a finisher program for well-conditioned, well-trained athletes and NOT for people just getting back into fitness (see work by Verhoshansky from 1960's on). They are designed specifically to improve vertical jump height and speed, again, for ahtletes with a strong, pre-existing base of fitness. Is what's on P90X really plyometrics? MMM, maybe not. More like skipping, or what's also sometimes seen as 'submax plyos'- take a look at this section on google books about submax plyos, and you'll see pretty much the same moves this book talks about as warm ups for plyos. So calling what's on p90x plyo is a bit of a stretch - but not the right stretch to be plyometric. Let me explain. Mainly be taking advantage of the elastic properties of the muscle, loading the muscle using the stretch shortening cycle. For instance, doing a big jump off a box to the ground to stretch and load the hamstrings muscle (back of the legs) and then *as fast as possible* jumping back up again so that that stored energy in the hamstrings turns into kinetic energy in the concentric contraction of the muscle tightening as one gets up again. A distinction should be made between maximal plyometrics and sub-maximal plyometrics. Maximal plyometrics are low-repetition activities where the intensity of the depth jump or rebound exercise is such that maximal or near-maximal rebound tension is produced in the relevant muscles. Just like maximal strength training with weights, these powerful impulses are not meant to be imposed on the musculature every workout, nor are multiple repetitions even possible or advisable. So plyo: low rep, low frequency - does that sound like p90x's hour of hopping? So what's p90x "plyo" doing? Well it's more like skipping without a rope - because p90x couldn't count on one having room for a skipping rope. It's also another higher intensity cardio workout. And it may also help with prepping the muscles and joints to take greater load. So it's not like it doesn't do anything - but mainly it's one more way to do a fatiguing, high cardio workout and call it something bigger than it is to lend it excitement. By the way: want to improve your vertical jump? develop your squat, or swing a kettlebell - not kidding. Way better results than box jumping. We'll come back to this in part three. Now this is not to say there isn't a role for jumping about: kids once upon a time did this regularly with skipping games. Boxers and other athletes jump rope. But it's kinda sexing it up to call plyo-x plyometrics. It's endurance training via hops that are not gated to speed (no. of reps per those 20 secs for example). Yoga X is a form of yoga you won't see anywhere else -a sort of faux Ashtanga first series - sort of. It clocks in at about an hour 20, one of the longest and most challenging workouts because of the massive balance/stretching work going on. Folks on the p90x forum will comment at how much better their "yoga" work becomes as they do the program, and attribute the program to improving the stretch in the postures they achieve and the better balance. I did too. Turns out that a lot about stretch has to do with perceived safety (reduced threat - all the nervous system can process is "is there threat? yes or no"). As these moves become more familiar, (and as the body becomes in fact stronger from doing these and the other workouts) the body perceives the move as safer to do. Consequently the muscles relax and stretch more. Look at it this way: we can all apparently do the splits when we're unconscious without any reefing of tendons or muscles. What's different when we're awake? Do we need to do 12 weeks of 1hr:20mins of Yoga-X to achieve these results? Well, what are we doing this workout for? Horton says if he could only do one thing, it would be the Yoga-X workout. But why? What is the benefit of being able to hold a static balance posture for 30 secs? A huge part of yoga practice is also the breath. In the book Structural Yoga Therapy, the author talks about the focus of Yoga is about the Breath, not about the stretch. Where is that focus in Yoga-X, when Horton walks around the participants commenting on how much they're sweating and working to hold a posture? Doing a few seconds (literally) to a few minutes of Z-health work (overview) can have the same stretch deepening/balance sharpening effect or more of what yoga-x delivers. It does this with way reduced threat and way improved proprioceptive, vestibular and visual coordination. It takes maybe 8 minutes rather than 80. So again, what's the point of this workout? It's not calories; max caloric burn from yoga-x is 200. In 80 mins. The other factor in Yoga-X (and other X workouts) that let's one say wow felt ick starting, but after felt great is pretty much endorphins. Lots of ways to get those triggered too. Please note (please): i am in no way saying "yoga bad" - please see previous note on the inspiration i find in David Swenson's ashtanga performance. What i am asking is why is someone doing this particular thing, Yoga-X? do they understand why it is part of a program? or that they can get the same *effects* from other means (in less time). If there is a particular effect that doing this particular X session gives a person great! enjoy! but (a) is it delivering what it says it is? and (b) if this is what a person wants, there are alternatives here, too, that might be even better. Look you can do P90X and be happy. The only thing that comes close to being harmful maybe is plyometrics and it will likely fatigue anyone from continuing before they get hurt. And as i come to in Part 3b, the workouts may be reinforcing bad form since form isn't much of a criteria in any of these routines. And because we adapt immediately to exactly what we're doing, there's potential costs of repeatedly repeating poor form. Just to re-iterate, the point here is that this is a great program to entertain somone sufficiently to encourage that person to workout for 12 weeks. That doesn't mean these are great routines. Does a person need to do the above routines for as long as they are (an hour 20 a day) to get the same or how about much better results? No. We'll come back to this point in part 3b. For now, to sum up muscle confution. A big promise in P90X is getting ripped. Most folks might take that to mean building muscle bulk rather than simply exposing muscle that's there. As we've seen, there's at most maybe four weeks (for some people) in which to begin to build muscle fiber. And at that we're not talking 10's of pounds. Bottom line: Horton's premise though that "muscle confusion" is a big part of what makes P90X so effective doesn't stand up to what we know about how muscles begin to adapt to new demands being put upon them. Horton's program based around tons of variety also doesn't stand up to what we know about building a foundation for what comes after 12 weeks. But that's not what P90X is about. It's about selling programs. And here the promise is that visible six pack. Transition to Part 2: What's a six pack, really? The thing is, we know that the only way to get a six pack is, for guys, being sub 10% body fat, and for women, sub 16% bf. If you have been working away at your abs so that there is some hypertrophy there, and you lose a lot of body fat, you can get a ripped look. Since we know that not a lot of muscle growth takes place in an initial 12 week program, the only way in 12 weeks to get to that place is to burn off the fat. And the only way to get to those bf% numbers in 12 weeks is (a) not needing to lose a lot of weight in the first place combined with (b) significant caloric restriction. In Part 2, we're going to look how muscle building works, as well as at the understated role of diet in P90x and a bit more at how those before and after pictures happen. And we'll ask the question again, is P90x the best way to get this result? and what happens after the 12 weeks? P90x Critique Part 2: getting ripped - does p90x deliver? for whom? how? Muscle confusion, i love it. This morning i asked my leg muscles if they were ready to run to the gym, they never responded, so i drove. They still were not confused. Science should have shut down this P-nonsence X advertising, yet i observe people continue to purchase it. Sadness fills my heart. I read through all 3 parts of your post and I'm so glad I came upon it during my 2nd week of the program. You've just saved me so many hours. But one thing I am not clear on is why does p90x not help in developing strength? I don't want bigger muscles. I just want to lose fat and be a little stronger. So if I'm putting all my body weight on my arms and shoulders in a routine like yoga x, wouldn't that make me stronger? Maybe I didn't understand that part of your post. to be clear i don't say that p90x doesn't develop strength. I say that it emphasizes endurance strength. Nothing wrong with that; in fact it's a very good thing. You can get the same benefits swinging a kettlebell and great strength benefits pressing a kettlebell - just as one example. As said in part 2, to gain noticeable bulk, you have to go at it with purpose and with diet. If you're not trying, for most people, gaining sizable muscle mass is a challenge. yoga x doesn't put body weight on your arms; it's mainly on your legs, too. "...this is a great program to entertain somone sufficiently to encourage that person to workout for 12 weeks. That doesn't mean these are great routines." I am on my last weeks of p90x and have started to develop real 'attitudes' against some routines - not to be taken as 'I don't want to do the work'. At this point the program has done for me just wanted I need it do...at comfort my house reassured me to that I CAN workout and get results. A lot of workouts (or sets) are there just to kill the boredom but really have no value and saying this on BB site will get you called a heretic :). After I asked what most people did after 90 days (imagine that...life goes on past 90 days? lol) NO ONE had a suggestion other than..."do it again, second round...yeah...abs...yeah...bring it" or try to plug another program by BB. Now I feel great and am motivated to continue but would like some more sensible program that does not take as long. 1hr p90x workouts take me 1.5 hrs really and days with ab ripper are close 2 hrs of being in workout mode. For an non-athlete bound with a desk job this is a lot of time on daily basis. Any 'plan' you can suggest for someone looking to build muscle/strength and endurance? I'm also curious about level99's question of what to do after 90 days aside from a rinse and repeat. Nothing wrong with repeating given how much variety there is, but it's not always possible to do one hour at a time and it would be nice to find a supplement or something perhaps to alternate every 3 months. Anyone have ideas? i hope y'all asking about what happens on day 91 looked at part 3b of this series for post p90x or alternative to p90x approaches? In my strong opinion, P90X is actually much more a tool for developing strength than a "cardio" workout. Its workouts like Plyometrics and Kenpo-X are relatively simple, no comparison in intensity to Insanity (also by BB). At the same time, workouts like "Legs and Back", "Back & Biceps", etc. are really demanding. Tony Horton says throughout different workouts, however, that people who prefer to build strength / shape should use heavier weights, so that no more than 8-10 repetitions in a set could be done, while people who aim more to develop endurance should use weights which allow 10-15 repetitions. This is widely known fact, by the way. Overall, P90X is beautifully balanced, working on different muscles groups and alternating medium level cardio with strength workouts. You don't need to just take my opinion, here's a very positive comparative review by professionals - American Council On Exercise. Here's another study by ACE. Sure, P90X is not a bodybuilder program. In fact Tony Horton clearly said that one of the incentives in creating this program was his hate of bulky bodybuilders' figures. P90X2 even less focused on building muscle mass, and more on athletic performance. The question - what to do next after completing 90 days of P90X is a serious one. Personally, I switched to a new BB => Les Mills PUMP program (which I like much less). I'm planning to start P90X2 in several months, then I may repeat P90X, or do Cathe Friedrich STS (look for it, it's another high-end system). At the same time, parallel to PUMP I'm now starting with TRX suspension training (12 weeks TRX Force program) and going to combine them with Kettlebell training (workouts from TRX/Pavel Tsatsouline). Many P90X addicts repeat it again and again. Another valuable alternative seems to be CrossFit. Here are interesting public Google+ discussions on relative merits of P90X vs. Crossfit, etc. P.S. I am an Independent BB Coach and as such may be able to answer P90X/PUMP/RevAbs / etc related questions and even guide one through these programs. The more I'm reading on your first P90X articles set and this one, the more I'm looking on links you provided the more I appreciate that gigantic amount of work you preformed in bringing it together. Thank you! delighted that you enjoy p90x. good for you. As for ACE and its "studies" - they are paid research rather than peer reviewed research. What this means is that no one outside the company (ACE) checks whether or not the set up for comparison is rigorous. I'll say again, as i say throughout this series: p90x will have an effect. The degree of that effect is entirely gated by a large number of factors that of course an advertizing campaign to sell a product is not going to highlight. My goal in this critique has been to explore what p90x is actually doing. as the ace "study" claims is that one does p90x and their cardio fitness levels go up. Good. Swing a kettlebell for 15 mins - 40 mins a day, you'll get the same or better results. You can check out ACE's review of kb's (pdf) for that. SO me, whatever someone wants to do to move more is a Good THing. My concern is that folks may think it's the ONLY thing that will deliver a particular set of results; or that it will deliver a specific set of results etc. I think that's pretty clear if you read the whole piece. me i'm interested in working with folks for a lifetime and figuring out how to support a lifetime of effective movement/performance, and for the most part am moving away from "programs" to more goals based, auto-regulatory practice. Barholics (video) is an example of the kinds of practice that i am finding increasingly compelling: lean strength. Combine this with some endurance work and goodness.